Any lien holder can use this form to release all the claims from the vehicle. He/she can do so only by giving certain mandatory details like his/her full name, borrower’s name, vehicle’s identification number, current certificate title number, lien amount and car’s make and year. Any one can use this form to release their own borrower from any lien. This form will help to release all lines, rights, and claims of any project and all other property or title of the Owner’s name and contractor’s authorisation. The lien holder can apply this form to complete all the applicable sections like, the details of the owner, lien holder, mobile home or vessel and motor vehicle, etc. Same date of Lien and shown on the certificate’s title, require for this form. Follow information which given in the form and shall send to the lien satisfaction and mailed properly. Without hiring any lawyer, easily can release any registered lien of property. The state methods must follow in the time of release line on property. The payment of complete amount can be the easiest way to remove any lien. 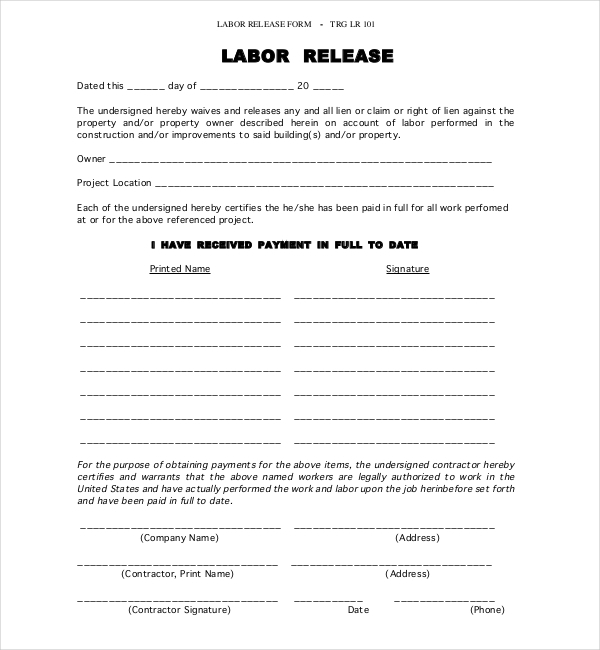 This form can use for certify to all the contractors, laborers and material men who have furnished labors, materials or services to the property for their complete payment for their work, services or materials furnished or performed as per the terms. 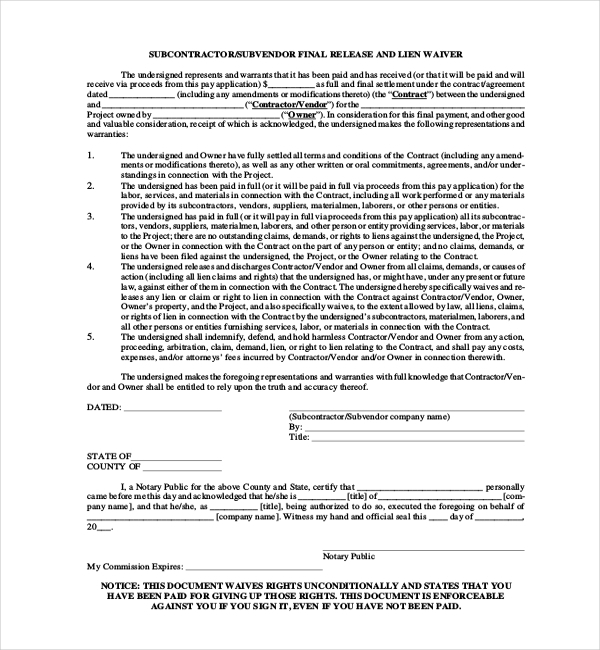 The contractor can use this form for, employed to furnish materials, labor and/or services for construction, improvements and/or repairs to property. The Neighborhood Finance Corporation sanctioned that company’s payment for the homeowner’s request. They are removing all liens and rights to register a lien against building improvements. 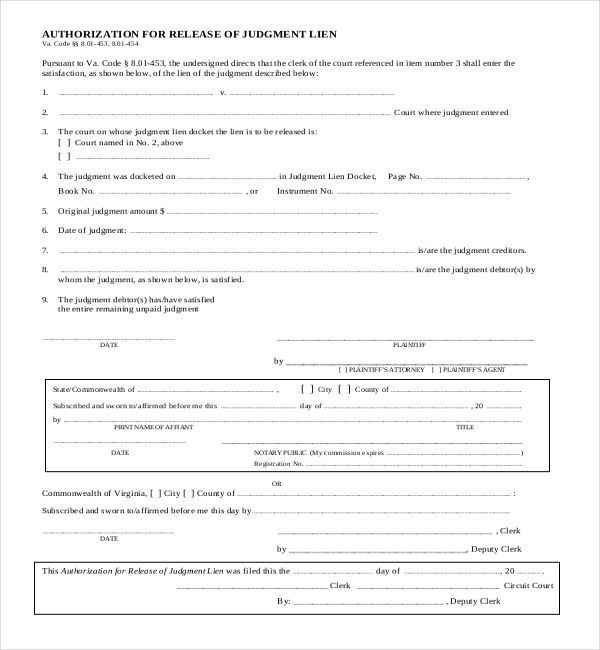 A Judgment Lien release Form is used to give notice of complete release of a previously filed Notice of Judgment Lien. After complete payment of lien, Judgment creditor will register an acknowledgement of judgment satisfaction with court. Certificate of service is attached with judgment satisfaction acknowledgment as proof that copy was served on judgment debtor. Using this form, the lien holder can release all the lien, right or claim of lien against the owner or property. For the intention of acquiring payments, the person certifies that the workers are authorized legally to work. They also certify that the workers have performed their work and got complete payment till date. The Company can use this form for certification of payment of that person for all used materials furnished . 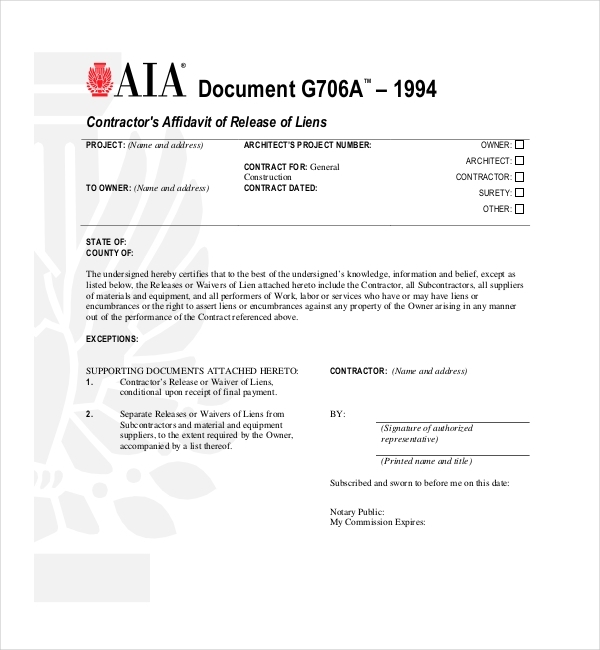 This form also certifies that all the subcontractors employed by the person have been fully paid. They are releasing all liens or claims or right of lien for materials or labor furnished or performed. Using this form the owner certifies, for complete settled of all terms and conditions of contract with written commitments and agreements related with project. This form also can use for certification of full payment for services, materials and labor related with contract including works executed and materials offered by vendors, suppliers, subcontractors or other persons. The person will have to pay or resolve any lien. They should request a release-of-lien form. 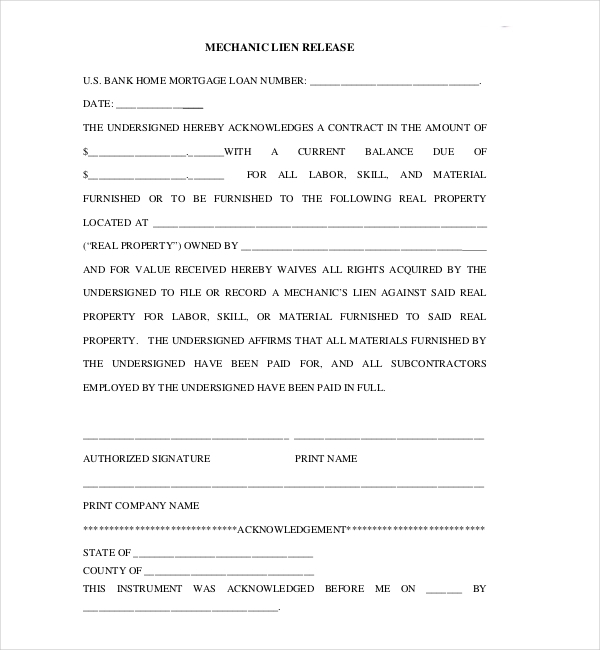 The lender has to sign this form as a proof that the lien should be released. They can get this required form from their lender or their attorney of the local government. They have to get the lean release form notarized. They will register the form with their county recorder’s office. Their county recorder is keeping track every property owner in their county and any liens on property. The office may need a registering fee. This can make the release of their lien public. They must keep a copy of the lien release form for their personal records. 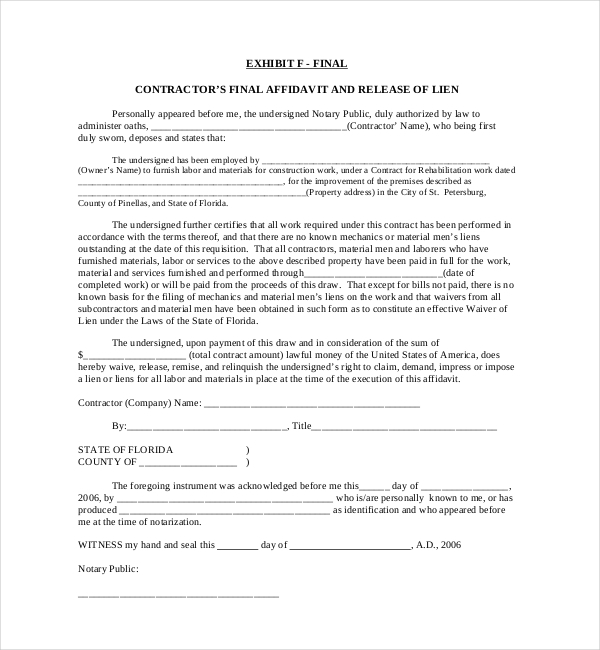 This form can help the person to remove lien from their property if they disagree with any details related to the lien or the existence of the lien. This form will assist them in researching the claim’s origins and negotiate final amount if they are actually responsible for the debt. 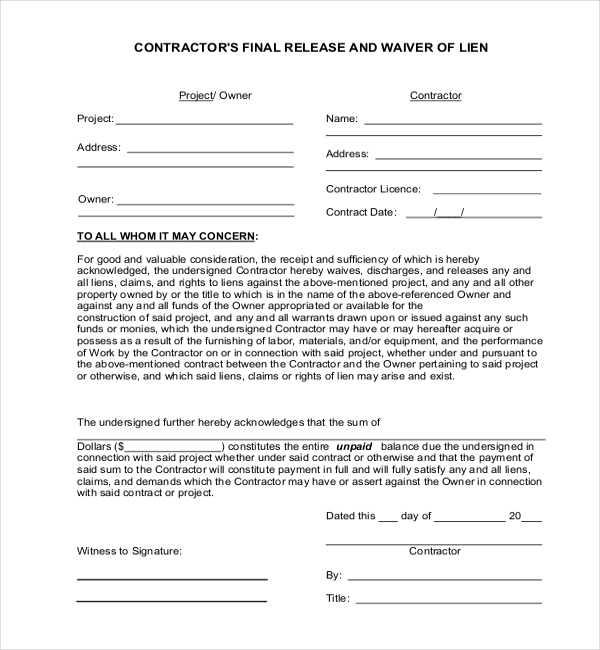 There are two types of lien release: conditional or unconditional release on progress payment and conditional or unconditional release on final payment. Lien releases on progress payments state that the contractor is releasing any right to lien on property till they have been paid to date. A lien release on final payment states that only upon check or receipt of full and final payment, the contractor releases right to lien on property. For any contract can use this form for any individual providing service. Without signed and delivered of authorized agent or claimant, no such form can binding. Here are some of the people who are most likely to use this form. 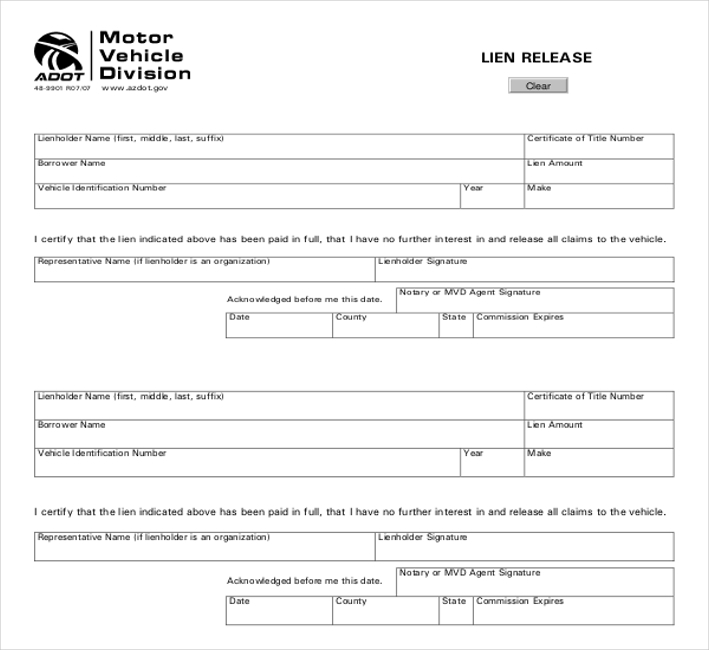 Previous Car owners use lien release form to release any lien on the new owner after the full payment. Previous House owners can remove any lien from the new owner after they have made full payment of the house. Anyone gave their service on the basis of terms and conditions can use this form after full satisfaction (payment). Lien release forms are the service provider’s legal way to release any lien from the person who made their full payment as per every contract. Removing a lien requires them to renegotiate the debt amount or pay the debt. 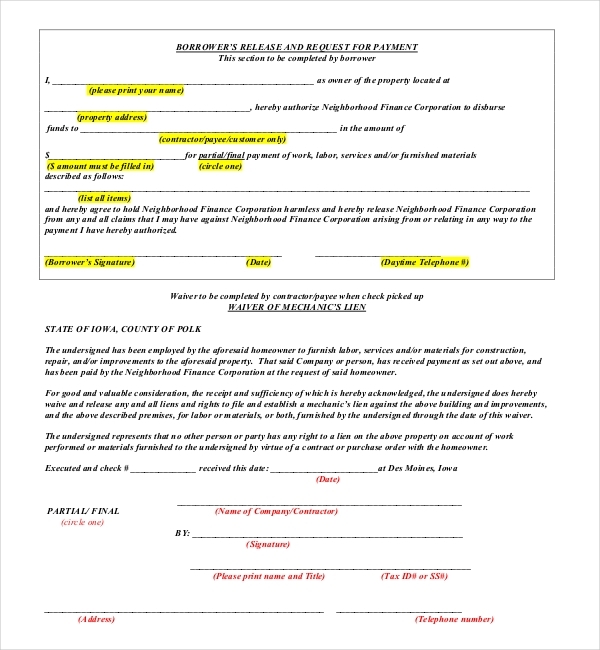 If the lien is not legitimate this form can help the person get a lien removed.